Ask fellow campers about "Spirit Mountain Campground" and nearby attractions. We called about availability and got their "after hours - (4:30)" recording stating there was lots of availabilities. Being new to this area and unfamiliar w/the park, we did not realize the closeness of things! Trying to get the big rig in with a tow was a bit tricky and we had no idea of where if any there were any 50 amp sites so we just used a 30 amp converter. The site was not level - our front tires way off ground so decided not to even put slides out or level. We would not try and get in there again with a big rig. The park would be great for smaller size campers though! We camped at Spirit Mountain Campground in a Motorhome. While we thoroghly enjoyed the park itself we were horrified to discover ticks on us and our dog. From merely walking through the campground, on the road, we all found ticks when we returned to our trailer. The park is beautiful and serene but I can never stay there again because of the ticks. It was unbelievable. We camped at Spirit Mountain Campground in a Travel Trailer. The best thing this place has going for it is its location and natural setting in the woods. Beyond that, it needs some work. 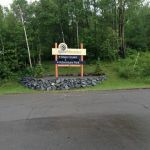 We enjoyed having a quick drive to Duluth and other area attractions. We also enjoyed sitting at our site among the trees and usually only hearing wildlife, although occasionally you could hear the distant hum of I-35. The facilities themselves are in need of upgrades and care. First, the utilities for most sites are on the wrong side of the camper, forcing you to run your electric and water across the site and underneath the camper. Several sites are unlevel and in some cases too close to their neighbors (while others enjoyed a lot of separation.) Be sure to know the layout of your site before booking as some are so close together that they are really only meant for group camping with one camper backed in, one pulled in. Even more sites were so small that only a tent would fit, let alone your car- and I'm not referring to the walk-in sites either! It's almost as though the sites were put anywhere space could be found and without the needs of campers in mind. There are bright streetlights that are left on 24-7 (so much for being "green") and are annoying at night when you're trying to watch the stars. Some of the lights are burned out (lack of maintenance) which was fortunate for us since one was right at the front of our site. The front office was hardly ever open so if you need firewood or other basic supplies, expect to go in town. The dump station was difficult to use because the road was lower than the drain; I had to constantly raise my sewer hose up and down in order to empty the tanks. Our biggest disappointment was with the bathrooms. They were clearly NOT cleaned on a regular basis as we observed the same trash (whiskers, toothpaste, hair) in the sinks and showers for several days before they were cleaned. The shower curtains themselves were stained with black mold. There was no hand soap or any way to dry your hands. We watched the cleaning lady one day sweep out the restrooms (not mop) while her car was running, so that shows you how much attention was paid to maintaining the bathrooms. Overall we were disappointed. This place could be so much more if it was maintained better and some of the sites were reworked. It's really a shame because if they did make the improvements, it would be one of the nicest places around in a beautiful part of our country. Too bad. We camped at Spirit Mountain Campground in a Travel Trailer. Beautiful scenery with wildlife. We camped at Spirit Mountain Campground in a Tent. We had reservations (used internet site) to stay at this campground for one week. We arrived on a saturday afternoon about 4:30 p.m. Found my site and had a good idea that my 29' travel trailer was not going to fit although I was told previously that it would. I backed in, and the tongue of the trailer was in the road. The door of the trailer opened into multiple trees and a thick patch of poison ivy. When I made reservations there were only two sites open at the time. Since the site I reserved was unusable and inhabitable, I went to the office to see if I could move. There was nobody at the office and I called two phone numbers that I found from the Minnesota campground guide and nobody answered the phone either. I had no choice but to find a different campground. We left a note explaining our situation and they called 1 day later saying that they would refund all but one days worth ($25) due to policy. I felt that this was unfair because I did not back out of the 'deal'. I showed up on time and there was no alternative for me due to lack of personnel. I give this campground a rating of 1 because 0 is not an option. If I had a full refund they would have had a 3. It is a nice location and the sites are small and private, good for tents and pop-ups. We camped at Spirit Mountain Campground in a Travel Trailer. We only toured the campground since we were in the area (we have a popup). Sites are all set in heavily wooded area so most if not all sites are quite private. Restrooms located at each of the 3 main loops of the grounds were clean and good showers and sinks. Showers even had rubber basket-weave mats in them, a plus in my book. Sites were often small to average size, some with little free space in them for added play room. Sites were not all level and a few would require an extra eye for backing in. A few sites were pull through. Overall, rugged grounds at most sites, some were nice so we marked them in our pamphlet for future reference. Grounds are located at top of the hill above Duluth just off I-35. Gravel roads on grounds. If you like private sites in heavily wooded area, you will like this. Be sure to tour the grounds before deciding on a spot if available before committing, as some of the sites are rugged, being small or unlevel, with some small sharp valleys next to the site which may make a challenge in the dark going from your camper to the picnic table. We camped at Spirit Mountain Campground in a Tent Trailer. Are you affiliated with Spirit Mountain Campground ?